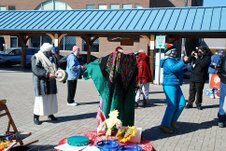 There were live performances including the Russian puppet show "Balaganchik," which starts the famously recognized puppet "Petrushka." 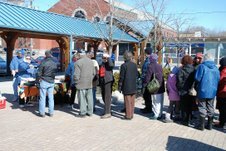 There was live Russian music with a taste of Russian pancakes (blinis) generously donated and served by "A Taste of Russia." 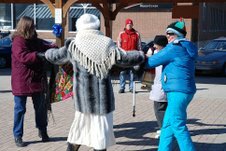 Maslenitsa (a.k.a. Butter Week, Pancake week or Cheesefare Week) is a Russian religious and folk holiday. It is celebrated during the week before Great Lent - which is the seventh week before Pascha (Easter). 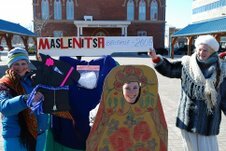 In Slavic mythology, Maslenitsa is a sun festival, celebrating the imminent end of winter. Blinis (Russian pancakes) are the most popular traditional food on this holiday, symbolizing the sun. 1. Russian pancakes (blinis) generously donated and served by A Taste of Russia. Blinis are the most popular traditional food on Maslenitsa, symbolizing the sun. 2. Performance 3. Everybody wants to try hot Russian blini. 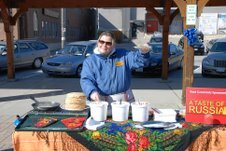 Inna (right) and Cathy (left) from A Taste of Russia serve blinis. 4. 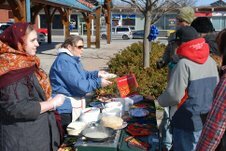 Maslenitsa in Belleville. 5. 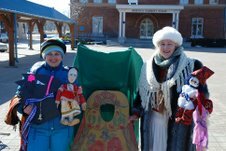 Antonina V. Duram, the Director of Canadian-Russian Cultural Society with Russian puppets Masha (left) and Petrushka (right). 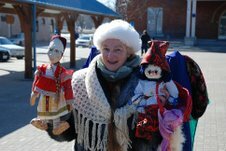 Petrushka is a stock character of Russian folk puppetry (rayok) known at least since 17th century. Traditionally he was a kind of a jester distinguished by red dress, red kolpak (a kind of pointy hat), and often a long nose. 6. 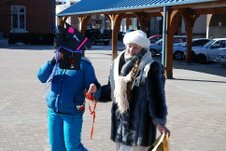 Svetlana Dylevskaya (A Taste of Russia, PR Director, left) and Antonina V. Duram, the Director of Canadian-Russian Cultural Society (right). 7. "Horse" and "Russian Beauty". 8. Russian khorovod. Khorovod is a Slavic art form, a combination of a circle dance and chorus singing. 9. 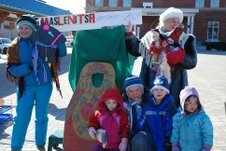 People of all ages like to participate in Maslenitsa, especially the kids.